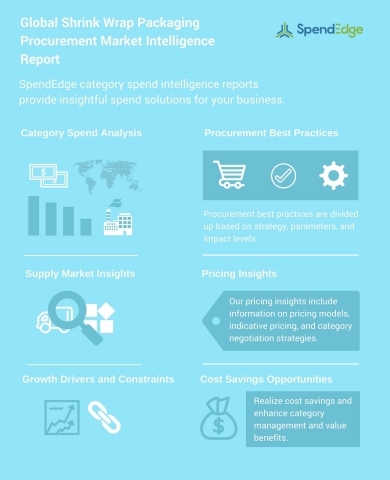 LONDON--(BUSINESS WIRE)--Global procurement intelligence advisory firm, SpendEdge, has announced the release of their 'Shrink Wrap Packaging Procurement Research Report.' The insights and data in this report provide a strategic analysis of the supply markets, factors influencing purchasing decisions, procurement best practices, pricing models, supplier landscape, and an analysis of the supplier capability matrix for the packaging and labeling industry. This report breaks down the data and analysis behind the procurement of shrink wrap packaging and acts as an all-inclusive guide for making smart purchasing decisions. “The growth of the global shrink wrap packaging market can be attributed to the increased demand for shrink wrap packaging from industries such as F&B and pharmaceuticals and short production TATs for large volumes,” says SpendEdge procurement research analyst Tridib Bora. “The aging global demographics is also one among the predicted reasons for the increase in the demand for pharmaceutical products, resulting in demand for pharmaceutical packaging,” added Tridib. Rapidly developing industries such as e-commerce are triggering the growth of the shrink wrap packaging market. Wrapping is highly adopted in the e-commerce sector due to its transportation-friendly characteristics further increasing its demand. Also growing trade activities have led to the increase in transportation of goods and to protect them from damage; pellets and carton boxes are wrapped with multiple layers of shrink films. This has lead to a high demand for shrink wrap packaging globally. Procurement managers must identify and adopt efficient supply chain management systems that allow them to exert better control over service providers, irrespective of the prevalent market forces. This helps them manage expenses and service quality better. Lack of control over the pricing of raw materials and in determining the compatibility of the package with the product poses a major challenge to buyers of flexible packing. Hence it is important for the procurement managers to engage with suppliers that have a well-defined cost model. The unit pricing and cost-plus pricing are the two pricing models that find comparable adoption in the shrink wrap packaging industry. Unit pricing model helps to make bulk purchases thereby, increasing the opportunities for price discounts. Whereas in the cost-plus pricing model offers a high level of transparency as the prices vary according to the prices of polymers. Furthermore, in this model purchase price of the packages can be lower than the fixed market prices providing additional benefits to the procurement managers. SpendEdge shares your passion for driving sourcing and procurement excellence. We are a preferred market intelligence partner for Fortune 500 firms and other leading companies across numerous industries. Our strength lies in delivering robust, real-time procurement market intelligence that helps sourcing and procurement professionals make informed decisions. These innovative procurement solutions help enterprises transform structural capabilities, improve execution efficiency, and fast-track time to savings. SpendEdge has announced the release of their Global Shrink Wrap Packaging Procurement Market Intelligence Report.